The district of Panchmahal is located in the eastern part of Gujarat. 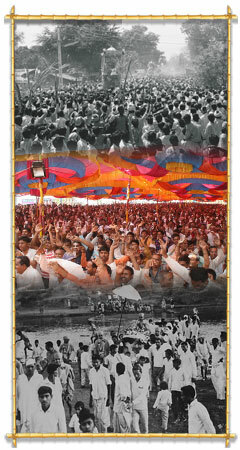 It is spread over 11 regions with the Godhra as its main city. The name ‘Panchmahal’ refers to the 5 (panch) sub-divisions of the district, Godhra, Dahod, Halol, Kalol and Jhalod. Historically, the inhabitants of the region were considered to be one of India’s most poor, lawless and superstitious people. Even now, the region is still considered to be one of the India’s most rural districts. Up till very recently, the majority of the population lived in the forests, with no basic homes. They had no skills or opportunities. Some of the people lived in makeshift shacks in the fields. Some lived in small mud huts with no amenities. Furthermore, the region had very little infrastructure. The people of Panchmahal remained suppressed by blind belief in superstitions and black magic. The poor, uneducated, tribal folk of Panchmahal were tormented by exorcists, who used mystic rituals to free people from the torment of ghosts or spirits. However, in return for their services, the mystics frequently extorted money from the frightened people and took advantage of them and their gullibility. If the people did not pay, they tormented them and caused havoc. It became an endless cycle of distress and misery from which the people were unable to escape.